As the 2018 FIFA World Cup prepares to come to an end and another world champion is about to be crowned, there’s still plenty of soccer left to be played (and watched!). Even if your team got knocked out in an earlier round, be sure to savor the final moments of this World Cup since the next one won’t be around for another four years. Soccer fans and foodies alike can rejoice because MIAbites has picked out the best places to watch the remaining games, especially the 2018 World Cup Final. If you’re rooting for England (#itscominghome), catch the World Cup games at Fadó Irish Pub in Mary Brickell Village. Be sure to take advantage of all of the amazing World Cup food and drink specials that Fadó is offering. Specials include select $5 beers on draft and in cans (Bitburger Pilsner, Terrapin Lua, Dos Equis Lager, Carlsberg Lager, Yuengling Golden Pilsner and Sam ‘76 Lager/Ale) and $5 shots (Jager and Fireball). In addition, they offer a tasty bar menu featuring their Bavarian pretzels with mustard and beer cheese sauce, pub sliders, and jumbo wings with Guinness BBQ sauce or Buffalo sauce. Fans can also opt for more traditional dishes like Harp beer battered fish & chips and the Fadó Reuben. Soccer fans who watch the World Cup Final at Fadó can also order from their breakfast menu which features a traditional Irish breakfast (two eggs, Irish sausages, rasher, black and white pudding, mushrooms, tomatoes and Guinness cheddar bread), an American breakfast (two eggs, Applewood smoked bacon, breakfast sausage links, hash browns, sourdough toast) or chorizo breakfast tacos. All of these great menu selections and specials will have you cheering more than just “it’s coming home” during the game. If you’re rooting for France and/or just like delicious French food, grab your team jersey and head to Amour de Miami in Downtown to watch the games on July 14 & 15. Fans rooting for France can enjoy the third place play-off and final game with Amour de Miami’s on Saturday and Sunday with French delicacies like charcuterie and cheese platters, paté, homemade duck foie gras, soups, and burgers. Fans can also enjoy their Saturday & Sunday brunch favorites such as the croissant eggs benedict, eggs a la Coque, French steak and eggs, and even create-your-own crêpes, pancakes and waffles (think extra Nutella for good luck!). The best part is that fans will receive free bottomless mimosas with the purchase of any brunch entrée, exactly what fans need to stay hydrated. If you’re rooting for Belgium, don’t miss the World Cup soccer watch party at Fritz & Franz Bierhaus in Coral Gables. The Bierhaus Plaza is the party place to be for incredible Bierhaus drinks, breakfast and lunch specials along with screens that are 16 feet large, with additional TVs and indoor and outdoor seating. Fans can’t go wrong with its World Cup menu and selection of imported beers. Enjoy 14 ounce, half-liter, 1 liter, and 2 liter “Das Boot” pours of their Bitburger Pilsner, Kostrizner Dunkel, Stella Artois, Paulaner Weisbier, or even Red Bull O Radler with Paulaner. Nothing pairs better with beer than the classic Bierhaus staples. Fans can nosh on classic schnitzel, the sausage sampler, which features three different types of sausages, potato salad, and sauerkraut or the giant Bierhaus bretzel mit Liptauer with spiced cream-cottage cheese. The menu also features the Bierhaus sliders, empanadas, wings, burgers, and a cod fish fry. Just be sure to arrive early to reserve your table and space on the plaza! Croatia fans who can’t be at King’s Landing can all gather at City Works Doral. 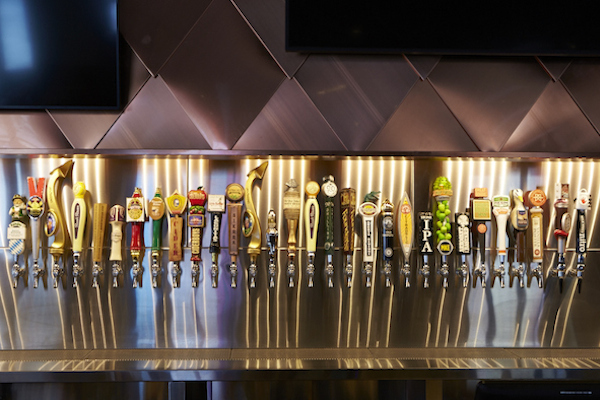 City Works Doral has a sprawling craft beer list with over 90 local and global pours along with gigantic HDTVs making it the perfect spot to enjoy the games. Choose from their delicious bar bites, including crab fondue, fried pickles, cheese curds, and buffalo shrimp. As if that wasn’t enough, be sure to partake in their incredible brunch on Saturdays and Sundays. For just $30 fans can enjoy one of their spectacular brunch entrees AND unlimited mimosas until 4pm. City Works’ brunch menu includes show-stoppers like the stuffed French toast (Brioche bread, Bailey’s Cream cream cheese, vanilla bean ice cream battered and mixed berry compote), the Breakfast Sandwich (green onion cheddar biscuit, breakfast sausage patty, aged cheddar scrambled eggs, habanero hash browns, and pico de gallo) and the pork benedict (smoked pork shoulder, poached eggs, English muffin, BBQ hollandaise, habanero hash browns and pico de gallo). While you’re there, be sure to get a raffle ticket before the second half of the Finals for your chance to win an authentic Cristiano Ronaldo jersey at the conclusion of the finals. They’ve been giving raffle tickets away since the first game. All of these recommended locations are suitable for fans of any team and will accommodate everyone on a first-come/first-serve basis. Regardless of what happens on the field, you can’t lose with these amazing World Cup specials.